A spaghetti dinner is a real favorite in our household but can be a little bit on the heavy side. 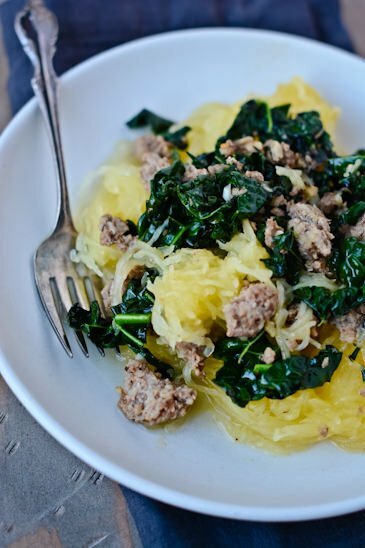 By replacing our favorite pasta dishes with spaghetti squash we get the same great flavors with a fraction of the calories. It wasn’t an easy sell and it will never replace our traditional spaghetti night but it’s a nice change for when we are all trying to eat a little bit lighter. 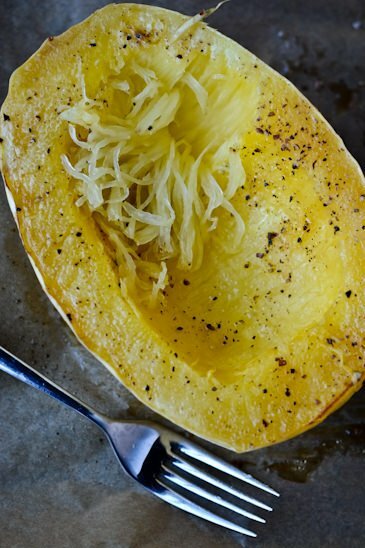 If you’ve never roasted a spaghetti squash before it couldn’t be simpler. All you need to do is slice it in half, rub it with a little olive oil and some salt and pepper and let a hot oven do the rest. 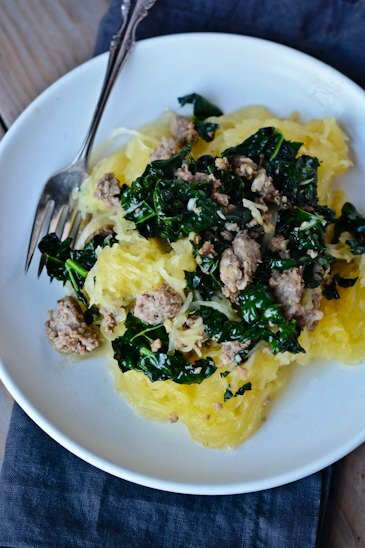 I’ve paired it here with some simple chicken sausage and kale but it’s also great with your favorite meatball recipe or just simply dressed with a little olive oil and parsley for a super light meal. 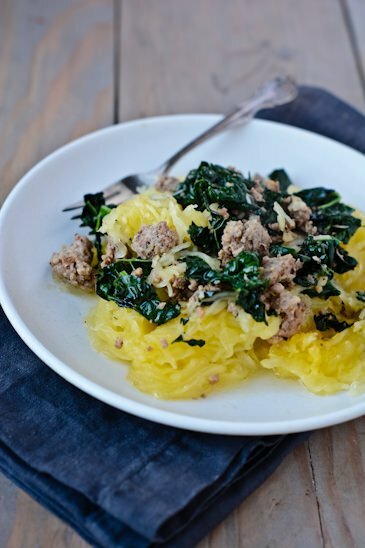 Slice a spaghetti squash in half lengthwise. Scoop out the seeds, drizzle with a tablespoon of olive oil, sprinkle with the sage leaves and season with salt and pepper, then place cut side down on a baking sheet. Bake the squash for 45 minutes, or until the squash flesh separates easily into strands with a fork. In a skillet over medium heat, saute 1 tablespoon of olive oil with the chopped garlic and sausage. Cook until the sausage begins to brown, remove the sausage from the pan and set aside. Remove the tough inner stems from the kale and slice thinly into ribbons. Add the kale to the skillet with the remaining tablespoon of olive oil and sauté until the kale is wilted and slightly softened. Add the sausage back to the pan along with the squash and cook until everything is heated through. Remove from the heat and toss in the ½ the parmesan. Season with salt and pepper and sprinkle with the remaining parmesan.